[AG-TECH] RE: AG Seminar: Fri 16 Nov 2pm, J. Dykes "Interesting? Aesthetic? Useful? 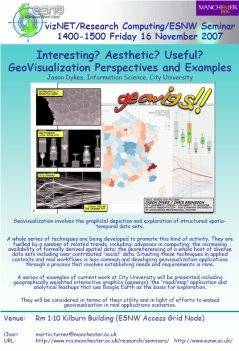 GeoVisualization Perspectives and Examples"
Previous message: [AG-TECH] AG Seminar: Fri 16 Nov 2pm, J. Dykes "Interesting? Aesthetic? Useful? GeoVisualization Perspectives and Examples"
Next message: [AG-TECH] RE: AG Seminar: Fri 30 Nov 2pm, W. Clocksin "Rapid 3D scene modelling from video clips"
From: Martin Turner [mailto:Martin.Turner at manchester.ac.uk]  Sent: 08 November 2007 21:50 To: seminars at manchester.ac.uk; ag-tech at mcs.anl.gov; mc-announce at lists.manchester.ac.uk; agsc-sites at lists.manchester.ac.uk; ag-event-announce at mcs.anl.gov; acstaff at cs.man.ac.uk; aig-research Subject: AG Seminar: Fri 16 Nov 2pm, J. Dykes "Interesting? Aesthetic? Useful? GeoVisualization Perspectives and Examples"
"Interesting? Aesthetic? Useful? GeoVisualization Perspectives and Examples"
A whole series of techniques are being developed to promote this kind of activity. They are fuelled by a number of related trends, including: advances in computing; the increasing availability of formally derived spatial data; the georeferencing of a whole host of diverse data sets including user contributed 'social' data. Situating these techniques in applied contexts and real workflows is less common and developing geovisualization applications through a process that involves establishing needs and requirements is rare. A series of examples of current work at City University will be presented including geographically weighted interactive graphics (geowigs), the 'road/map' application and analytical mashups that use Google Earth as the basis for exploration. They will be considered in terms of their utility and in light of efforts to embed geovisualization in real applications scenarios.